Reid Bigland is moving from his position as the Head of Ram Truck Brand to take command of Alfa Romeo in the NAFTA region. Taking his place at Ram is Chrysler veteran Robert Hegbloom. When Ram was broken off the Dodge brand to start an empire of its own, basically Hegbloom was Darth Vadar to Bigland's Emperor Palpatine. Though of course Mr. Bigland is far too handsome to be caught in a creepy black cloak. Robert "Bob" Hegbloom got his BA from Ferris State University in automotive management and an MBA from Central Michigan University in international business. He started working at Chrysler in 1986, but he identifies as a "car and truck guy" since his childhood. You might remember him from this Q&A he did with Ram engineer Mike Cairns about the new EcoDiesel truck. "When I was 5 years old, I had a spray gun in my hand. I was painting undercarriage parts on Model A's and just grew up with it in my blood," Hegbloom told The Detroit Free Press last year. Fiat-Chrysler bossman Sergio Marchionne used the opportunity to talk about what an awesome place Chrysler is to work, and how they nurture their own to rise in the ranks. I guess he's proving that point with Hegbloom's promotion. Now that Ram has been established as a separate entity from Dodge, Hegbloom's focus will be on the competition (Ford and GM.) But as we come up on 2015, he's going to face exceptionally strong resistance from both Ram's rivals. The 2015 Ford F-150, as you're probably tired of hearing by now, is all-new, lightweight, supposedly super-efficient, and coming in hot with a massive mob of brand loyalists. Meanwhile, the 2015 Chevrolet Colorado and 2015 GMC Canyon are about to give US truck buyers a "mid-sized" alternative to the segment dinosaurs from Toyota and Nissan. Ram made a big splash selling out 8,000 EcoDiesel half-ton trucks back in March, and even managed to best Chevrolet Silverado sales that month. But I have a feeling they're going to end up selling diesel half-tons to everybody that wants one before they topple GM from the number-two spot in trucks. Ram's going to have to come up with something else major that buyers can't have in a Ford or Chevy that will make them cross over and become Ram buyers. Ford is trying to own "lightweight," but their trucks aren't cheap. GM went for the smaller body style, but they're far from class-besting in towing. That is to say, there certainly are weaknesses in these brands that Ram might be able to leverage. But Hegbloom's going to have his work cut out for him, more than ever, to create a product that can stand out in the marketplace. If he can succeed, he's going to be a real hero in Chrysler history. 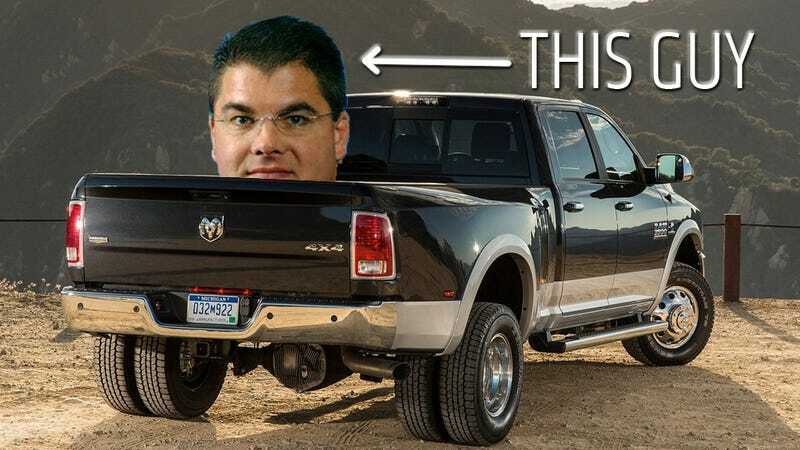 Perhaps a super-small, FWD cargo car a la the Dodge Rampage? Or pairing lightweight materials with their diesel engine and a new short-wheelbase vehicle to create the ultimate high-MPG hauler? We'll find out more soon enough as Mr. Hegbloom starts to shape Ram his way, or gives us a call. One way or another, 2015 is going to be a big one for trucks.